There’s a certain amount of smug satisfaction one can achieve by being the only person who thought to bring a first aid kit on a camping trip. And the obvious bonus that it could potentially save a life. How often have you ventured out for a hike, a bike, or other outdoor excursions, and you’ve not bothered to take the precaution of including a first aid kit? Sheepishly, most would probably confess that it was every single time. And yet, for me, it is the first name on the team sheet. It is the first thing that you pack before going on any adventure in the great outdoors. Particularly if you’re going with dependants. And if it isn’t – then it should be. With that in mind, here are the best first aid kits for hiking, backpacking and camping – or any outdoor activity for that matter. Stick around after my reviews for a buyers guide and FAQ, as if you’re not familiar, first aid kit purchases can be a daunting prospect. What if I Don’t Know First Aid? How do I Know if the Contents are Good Quality? What Should I Pack in a Survival Kit? 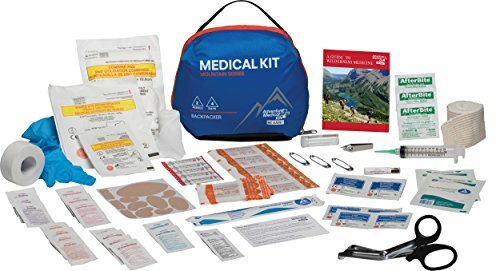 Can I Build My Own First Aid Kit? Review: Covering just about everything to do with camping and one of the best tent brands out there, it’s no surprise that Coleman would have an entry on this list. 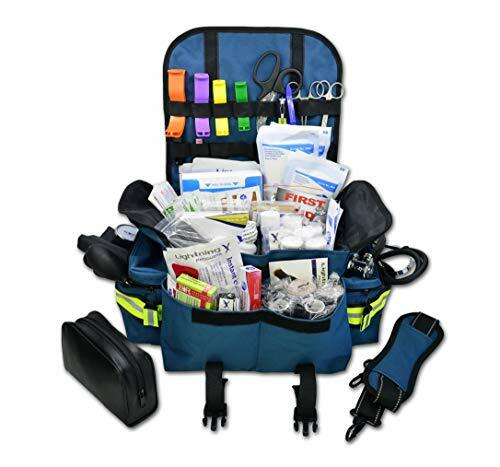 This is an awesome little kit, 27 pieces, with everything you need for first aid basics. Bites, cuts, and stings are all catered for in a stylish and handy brushed metal tin. A really good kit to keep handy, its compact size and sturdy tin are the selling points. It’s as basic as they come, though. 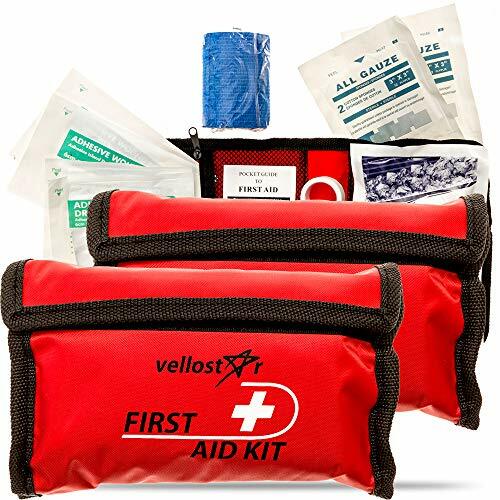 Review: Offering a little more variety than the basic Coleman kit, this compact velcro pouch from Vellostar has a decent selection of first aid essentials. Tweezers and scissors are included, and the pouch itself is a nice, trifold design with mesh pockets to keep everything tidy. A nice little all-around kit that has you covered for the minor bumps and scrapes. The super-portable pouch is great for just throwing in a bag. Review: Okay, so technically not a traditional first aid kit per se, but I still thought this was a very useful inclusion in this review as the injuries it addresses are all too real. 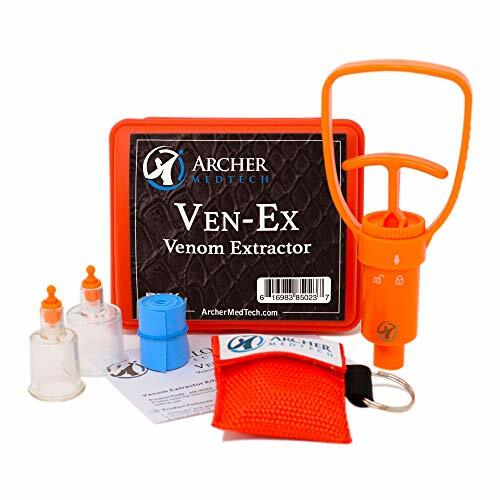 It comes with a tourniquet and venom extractor for bites and stings in the wild – which are highly likely if you or your family spend any time outdoors – particularly in the backcountry. A very useful bit of kit to keep around. Potentially life saving – or at least pain saving. A must if you’re backpacking the wilderness or camping in snake country and a useful precaution to take. Remember to seek medical advice if you’re ever actually bitten or badly stung. Review: Packing 115 essential first aid items into a portable bag, for the price and size this could well be the best travel first aid kit on my list. 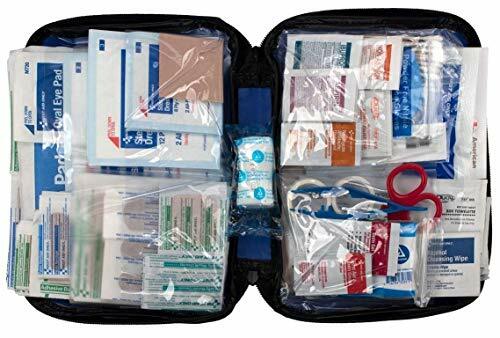 As well as the usual cuts, splinters, bites and stings package, this is the first kit to include trauma aids, including emergency blanket and poncho. It even comes with a single-use lightstick for assistance in the dark. For casual use, this is a great option. For the price, it’s well worth having a little peace of mind. Don’t expect it to deal with anything too nasty though. Review: As the name suggests this option is perfect for a trip, ideal for being outdoors and the best hiking first aid kit out there. The inclusion of an emergency whistle and compass is a really nice touch, but there’s generally just a great selection of items that have clearly been put together with the outdoor enthusiast in mind. Bag might get a little messy – but I’m reaching. Full marks for being a great price, packing loads of useful kit in and being super portable. To throw in a backpack, this is a great option. Review: Packing a whopping 299 pieces into this tiny little pouch and weighing just 1.2 lbs, this is the best lightweight first aid kit considering how much is contained within. Having said that, bear in mind that a lot of it is plasters and bandages in various sizes – but no less useful as a result. As lightweight and compact as they come. More plasters than you’ll (hopefully) ever need. A bit fiddly to root around in. 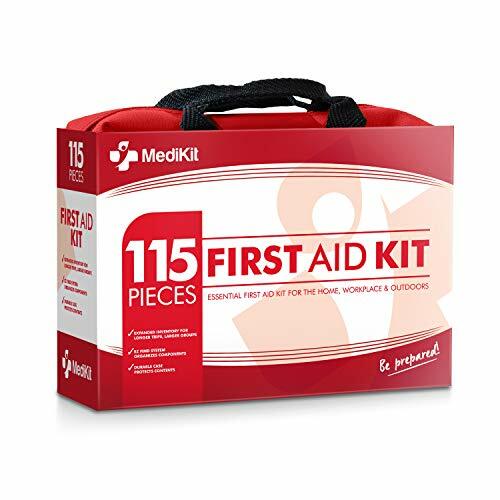 Size, weight and content make this a top rated first aid kit, great for throwing in your carry-on. It’s not the best for organization, though. Review: Very handy if you’re doing anything that’s likely to be near or involve water, this kit is in a watertight medical bag which will ensure its precious contents won’t ever be spoiled. It contains all the usual suspects, including plenty of bandages, gauze and dressings. For one to two people, this is up there with one of the best first aid kits for camping available. 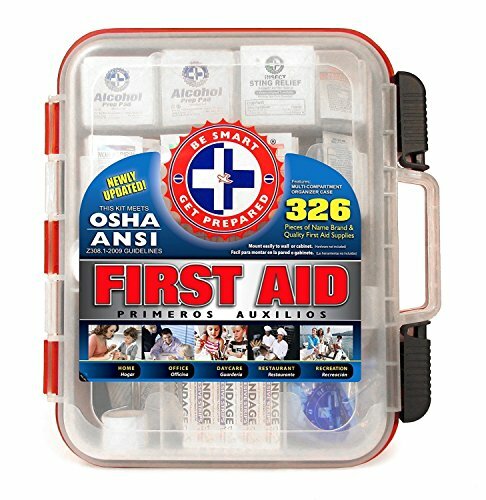 The best choice if you need a first aid kit that will be protected from the elements. 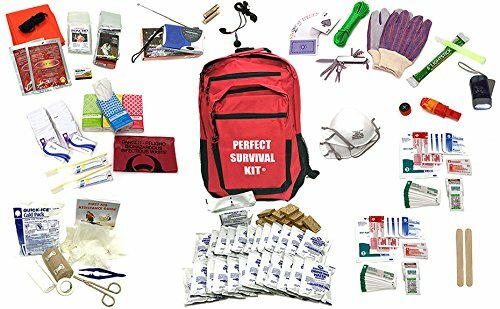 Review: This 200 piece first aid kit also incorporates items that would be useful in survival situations. A magnesium fire starter, compass and signaling mirror are included among other things, all organized is a smart, durable and water-resistant carrying pouch. As a combined pack, it’s one of the best first aid kits for survival out there. Waterproofing would have been nice. A decent 2-in-1 bag with first aid and survival items. Consistently top rated. Review: This is a solid, wall mountable, hard plastic case that contains enough first aid supplies for 100 people. It’s ideal for use in a variety of situations, but for a vehicle or frontcountry camping, I think it shines. It packs all the essentials in a really well organized and rugged container. Ideal for longer excursions or even as a base kit in the home. Tiltable internal shelves for easy access. A little on the large side if you’re on the go. 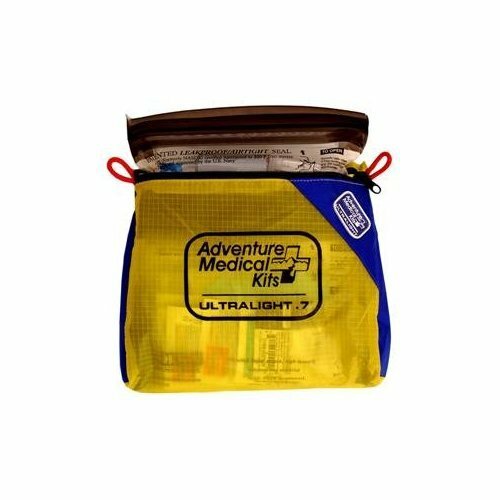 While it might not be the best first aid kit for backpacking, for more static situations you can’t go wrong. The case itself and internal organization are real selling points. Review: In a tactical, military-style pouch, you’ll find a load of useful, quality outdoor tools; including a compass, tough flashlight, knife and multi-tool. It’s an ideal precaution if you or anyone in your family like to stray off the beaten path. The MOLLE compatible bag is a particular highlight. The first aid kit is on the basic side. A nice combo kit with plenty of useful content. Great for survival, a little light on the actual first aid though. Review: Quite possibly the best first aid kit for backpacking, this small but mighty offering from Surviveware contains 100 essential items in a 600D polyester bag. It’s tough, durable and water resistant, while the contents are also of the highest quality. No more flimsy scissors that don’t cut or plasters that don’t stick. It’s pricey for 100 pieces. A really well made and put together a kit that is great for when you’re on the move. Ideal for hikers, bikers, and climbers. Review: Another really well-organized bag, this carry pack opens out to reveal four zippered sections clearly labeled with their contents. You’ll know what items you need for a specific injury at a glance. As well as having plenty of first aid gear, it also includes some useful medication such as ibuprofen and antihistamines. A book on medicine in the wilderness completes the package. Bag should have been waterproof. An excellent kit with a brilliant label system that could make a real difference in an emergency. However, considering it’s a “mountain series backpacker” kit they could have at least made the bag waterproof. Review: They’re not joking when they call this a deluxe kit. 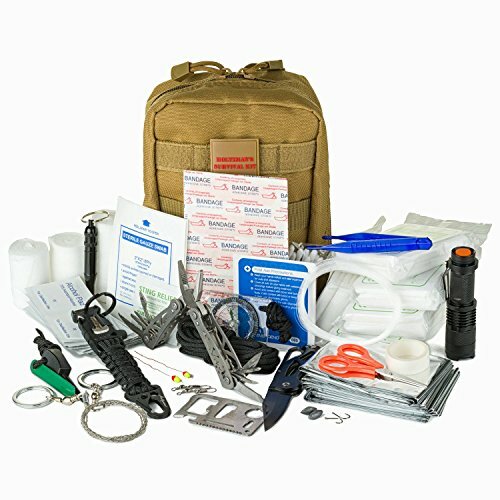 This packs in everything you could possibly need for any emergency situation, with the emphasis squarely on survival. As well as a comprehensive first aid kit, it includes water pouches, light sticks, an AM/FM radio and batteries… even a tube tent for two and a deck of playing cards while you wait to be rescued. They’ve thought of everything, surely the best survival first aid kit 2019. Loads of items for first aid and survival. There’s even a toothbrush and toothpaste. Few survival/first aid kits will be as extensive as this. It might be a little much for the casual rambler though. Review: This surely is the benchmark when it comes to the most complete first aid kit available – and well it might be for the size of the thing! This is only really suitable if you’re taking a larger group into the wilderness, but you can bet your bottom dollar this kit has you covered whatever the situation. The bag is top quality and excellent organization features, too. Just about everything a first aider needs. Not really suitable for anyone else. It’s not the best first aid kit for camping unless you’re camping with a group of school kids that is. It’s still a quality piece of kit to have in the home, though. Perhaps the most important thing when considering which first aid kit you should purchase, is what does it actually contain? And maybe even before that – what are you going to be using it for? 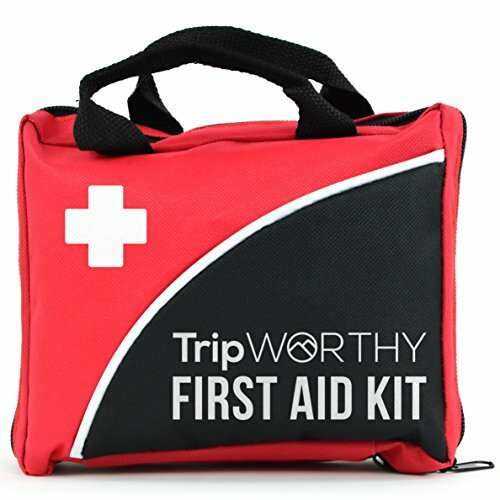 A first aid responder or group leader is obviously going to want a comprehensive kit at their disposal, with enough items to cover everyone for the duration of the trip. A lone hiker won’t even need a third of that. And then you have to ensure that the first aid items available are actually going to cover you for your chosen activity. It’s no good having 100 + pieces of kit while camping if you haven’t got a bite or sting ointment. A CPR mask in place of tubular bandages if you’re hiking. Missing a pair of tweezers if you’re working with wood. 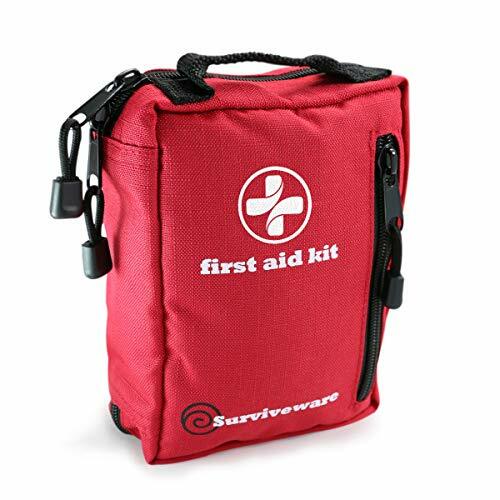 See the FAQ section for what I think every basic first aid kit should contain. 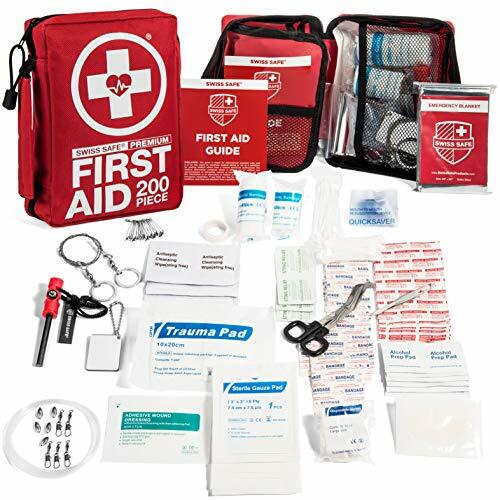 First aid kits come in a variety of sizes and weights, and depending on where you’re going and how you’re getting there, you’ll want to choose the most suitable one for the job. Larger, heavier kits are going to pack in loads of items for any eventuality, but they’re not going to be practical for backpacking. At least not in a trade-off with other gear. Likewise, a smaller kit isn’t going to pack as much punch when it comes to content, but you will be able to take it anywhere with little infringement on the rest of your stuff. It’s not rocket science really. For backcountry camping – take a lightweight kit. For frontcountry/vehicle camping – you can take something a bit more substantial. Just so long as you actually take one. As much as they come in different shapes and sizes, so do they come in different levels of durability. Whatever your first aid kit is contained in can be just as important as the kit itself. Ideally, you’ll want something that is going to stand wear and tear – especially if you’re on the go. At the very least, a bag should be water resistant, because if any liquid gets in it’s likely to ruin the contents. Plasters, bandages and gauze dressings will be null and void if they’re soaking wet. In my experience, you’ve got to get something with top quality zippers. It doesn’t matter how good the material might be if you’ve got an sh*t zipper you’ll pay the price as it eventually tears into the side of the bag. Never overlook the durability of your kit’s container – even that could be a lifesaver. Another valid point that people often don’t consider is how good the actual contents are. Just because you’re getting an expensive, ready-made first aid kit doesn’t mean that whatever is contained within will legitimately do the job. Or worse – everything in the pack is out of date! Remember – for optimum performance, these things have a shelf life. It would be ideal that the contents of your kit meet medical and industry standards, such as those approved by the FDA in the U.S. Manufactured kits can often be very misleading when it comes to value. You might see a kit that looks like it contains hundreds of pieces, yet when you come to open it up it’s all actually worthless and it isn’t likely to treat so much as a splinter. Be a little more discerning when choosing the kit that’s right for you – don’t just opt for the one that looks like it’s got loads of neat stuff crammed in and assume it’s going to be up to the job. Take the time to go through what each kit has and assess the value each item will potentially have to you and yours. A very good question to kick us off. It’s a shame that more people don’t know the basics of first aid, as I believe it to be a course that everyone should take at least once. This is especially true if you’re a traveler or outdoor enthusiast of any kind. But really, it would be so useful in any situation. If you’re unfamiliar with basic first aid techniques, I suggest you either join a course, or you study up using online guides and YouTube videos. Failing that, including an at-a-glance guide or booklet in your kit (as some of them already do) is a really good idea. You never know who is going to have to use it – and it could make all the difference. So glad you asked. 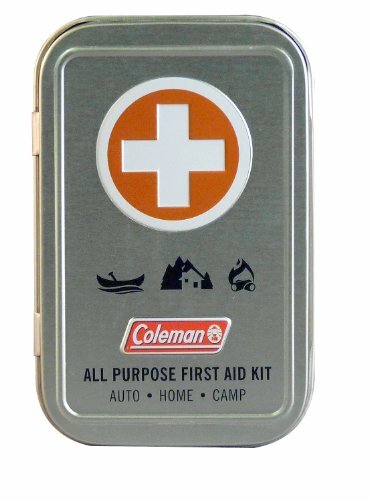 Below I’ve listed what your first aid kit should contain AT THE VERY LEAST for the outdoors. Anything above this is a bonus. Adhesive plasters – of various shapes and sizes. Small, medium and large gauze dressings. Scissors – good quality is a must! All contents should be of the best quality and within their use-by dates. This should serve you well for most minor accidents, bumps and scrapes in the outdoors, as well as packing some potentially life-saving gear too. As a rule of thumb, check to see if your chosen first aid kit is FDA approved – or approved by your local medical association. If these guys give it the go-ahead, you’ve got your peace of mind. Failing that, don’t be afraid to approach the manufacturer directly and get the info on their medical supplies. Especially to ensure they’re not palming off out-of-date items on unsuspecting customers. Out of doors, especially if you’re going backcountry, having some basic survival gear is never a bad idea. A combination of survival and first aid kit is a common sense approach. Below is a short list of some basic survival tools you should include. A good quality camping knife. That should be enough to keep you alive if ever you go missing in the backwoods. Grizzly bears notwithstanding. You most certainly can! Good quality first aid bags are available empty too, so you can build your own custom kit tailored to your needs. The process will obviously be a little more time consuming than buying a pre-made kit, and it may well work out more expensive, but the clear advantage is that you know exactly what’s going in and can adjust accordingly. You’re welcome to follow my first aid essentials list above, or you can check out this useful video below for assistance in putting together your own kit. I might be something of a nerd, but I actually find constructing your own kit to be a lot of fun! Please don’t tell anyone I said that. Finding the best first aid kit for hiking, biking, climbing camping or whatever you’re getting up to outdoors isn’t an easy task – there’s a lot of thought that should go into it. Hopefully, this little guide has helped you out and you’re closer to choosing the right product for you. And since we’re on the topic of safety first, why not download my eBook about safely traveling solo? It’s a must for anyone who wants to look after themselves while on the road.